Are you heading to Tokyo soon? 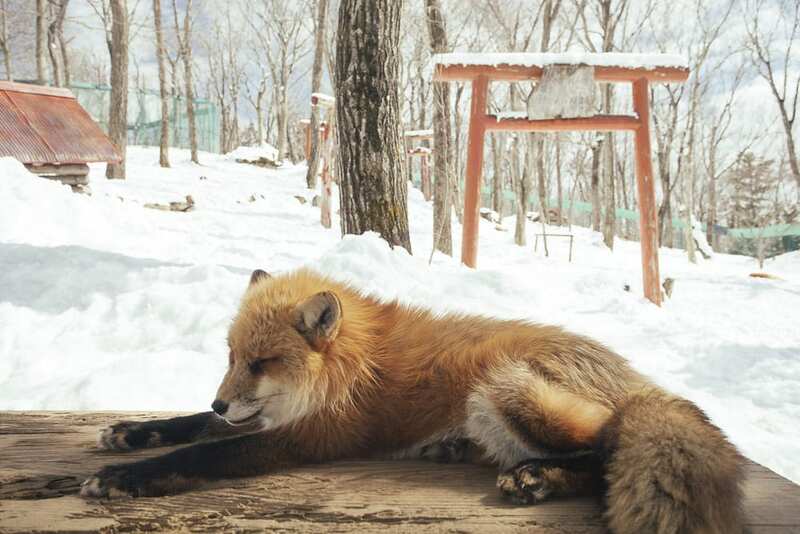 Are you interested in visiting the Fox Village Japan? Here’s a guide on how to travel to one of Japan’s cutest places. Before we get started, if you’re heading to Tokyo, I highly recommend my guidebook Hidden Tokyo, The Essential Guide to Experiencing Tokyo’s Hidden Magic. Unlike most books, it’s specifically written as a detailed Tokyo neighborhood guide and will therefore enlighten you beyond comprehension in its nearly 400 pages. Ok, let’s get started! 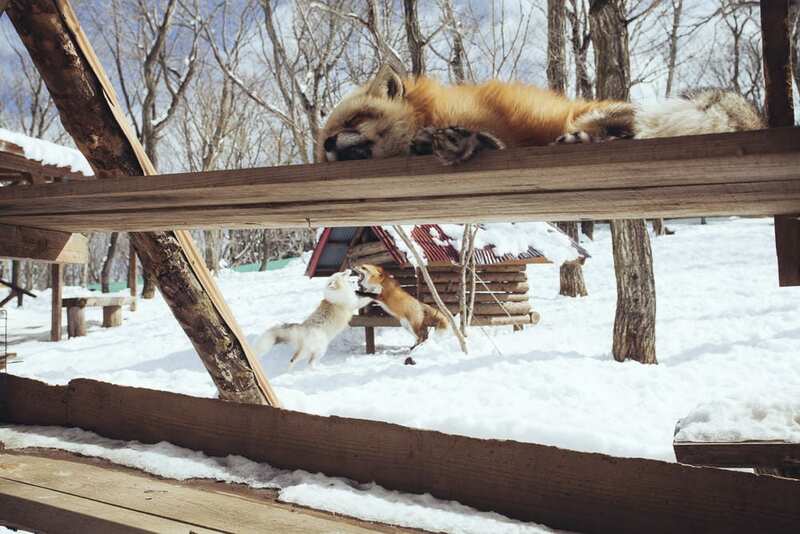 We took a trip to Shiroishi in the mountains of Miyagi Prefecture to visit a village filled with hundreds of real wild foxes with adorably cute smiles – a place better known as Miyagi Zao Fox Village. And for some reason they all look like they’re smiling at you, even when they are asleep. This could very well could be the cutest place on Earth. There are over six species of foxes here at the sanctuary. But, correction, it’s not an actual village, it’s more like a really large forest filled with foxes in an enclosed area. They all sit and bask in the snow and smile at your camera and occasionally you can catch a couple of them fighting like you see on Nat Geo Wild. I’m not the least bit surprised this place exists in Japan. TONS of cool places like this exist around Japan and it kills me every time I realize I cannot possibly see them all. Just google “bunny island Japan or Japan rabbit island,” and you’ll see a similar attraction. 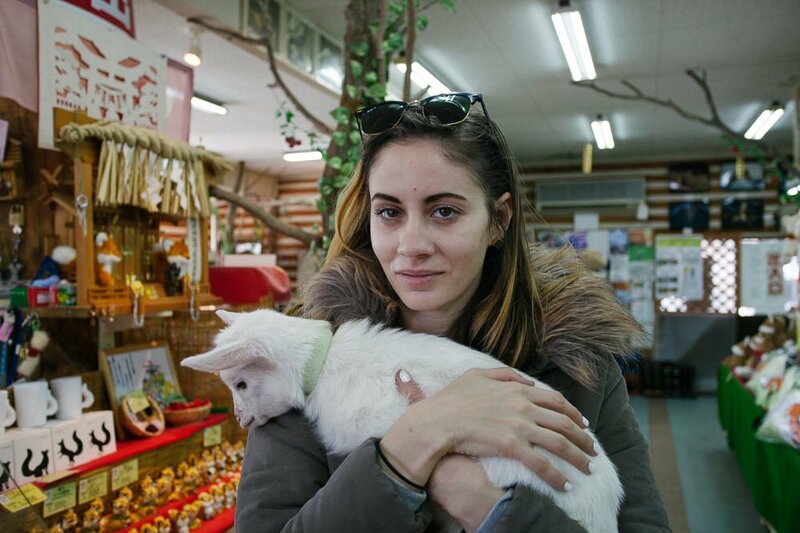 Zao Fox Village is incredibly photographic. You really can’t take a bad picture of these guys. Just be careful not to let them near your camera or lens as they are always on the hunt for food and have a sneaky reputation for snatching electronics. 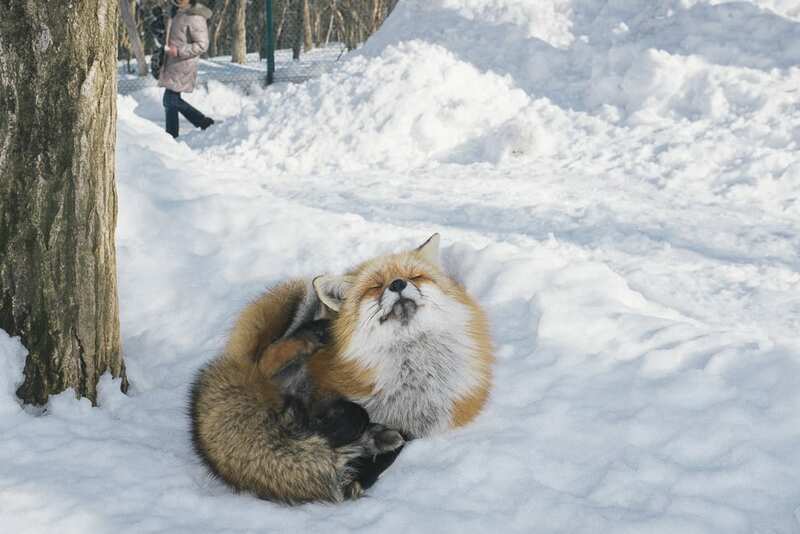 A fox stole his phone and buried it in the snow! He got it back. 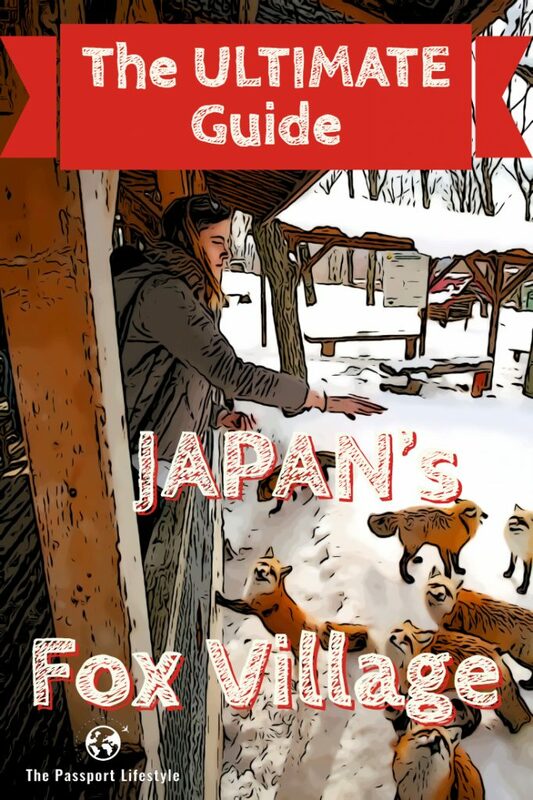 How to Travel to Fox Village Japan? From Tokyo, it’s a very easy day trip. Take the Shinkansen to Shiroishizao station. From Tokyo station, you don’t even need to change trains. The journey is just 109 minutes long. You can use the scheduling tool Hyperdia to arrange your train times. If you’re traveling to Japan and traveling outside of Tokyo, you will need a JR RAIL PASS. It will save you money in the end. The Shinkansen costs A LOT of money without this pass. You can purchase a pass from my website down by clicking on the link below or in my sidebar. This is a company I’ve been a partner with and trust their services and delivery. Once you arrive at Shiroishizao station, it looks like every other small town in Japan, except this station has a nice little JR tourism office out front once you exit the Shinkansen gates. Chances are there will be few cabs, but if not just walk into this office and the kind lady inside will call you a taxi. It took only five minutes before the taxi arrived. 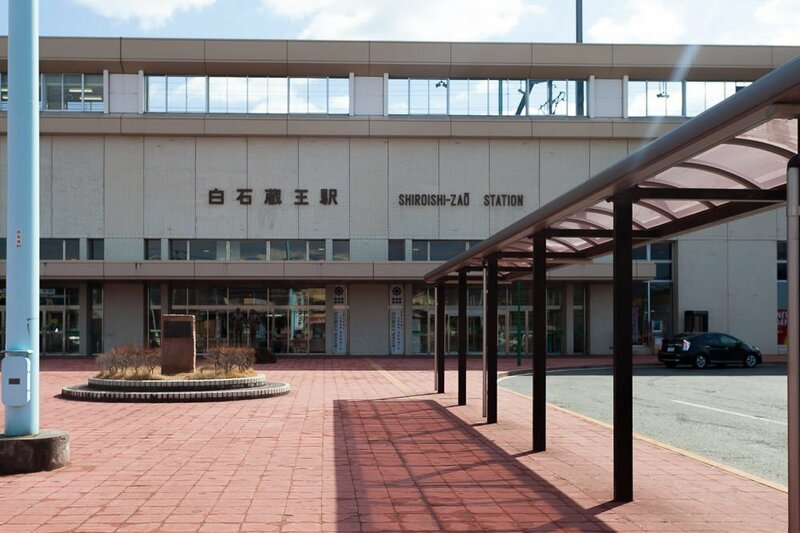 Depending on where you’re traveling from, you can also travel to Shiroishi station, but this takes a lot longer coming from Tokyo and is not a stop on the Shinkansen. The actual cab ride from Shiroishizao station to Zao Fox Village took about 20 minutes. It costs about 4000 yen each way. Wear hiking boots. There is actually a lot of snow in the winter, and even in the summer, there is fox poo everywhere! Read the directions given to you at the front office carefully. Don’t bring any of your own food into the fox enclosure. And don’t feed any of the foxes unless you are protected by the caged area. They will likely attack you if they even think you have food. You can buy food to feed the foxes for about 200 yen for a small bag of tiny hot dog pieces. But you can only feed them in the enclosed area. You purchase the food inside when you buy your entry ticket, but they make you stuff the food in your purse because the foxes can hear the crinkle of the bag and will try to get it. Be careful of things dangling like your camera strap and even your cell phone. Foxes are so hungry all the time and will pounce on anything they think is food. We saw a fox bury a girl’s cell phone in the snow. See the pic right below. Going in the winter is super scenic. Bring enough cash for cab fare. It’s about 4000 yen each way per cab ride. Don’t attempt to pet the foxes. There are a few domestic friendly foxes outside the enclosure. You can pet them only. Be aware of all the signs hanging up around the park. Bring food for yourself or eat beforehand because there’s not much to eat out this way at all. Also on a side note: Shiroishizao station schedules a Shinkansen every hour which means, that you can actually SEE a Shinkansen fly past you at its full speed as it hurls through the station. If you’ve never seen this before, I highly recommend watching one fly by you. It’s like watching a jet fly past you five feet away. Simply awesome and a bit creepy. With a Shinkansen ticket and taxi, I’d plan on spending around $300. BUT, if you purchase a JR Pass, then this your cost for the train ride will be covered. The admission ticket is around 1,000 yen. Personally when I was there, I wasn’t offended by the conditions. The animals were obviously well fed and engaged in a lot of activity. But, if you’re sensitive to seeing animals in any form of captivity, it’s best you skip this day trip. As you can see in the hotels map below, the number of properties is quite scarce but there are some. Another option is to stay out in Fukushima which is not far. Fukushima was obviously off limits for a long time due to the radiation impact, but it has started to open its doors to tourism again. If you’re at all interested in seeing the effects of the 2011 tsunami and / or simply seeing Fukushima, this is a good opportunity to see it. 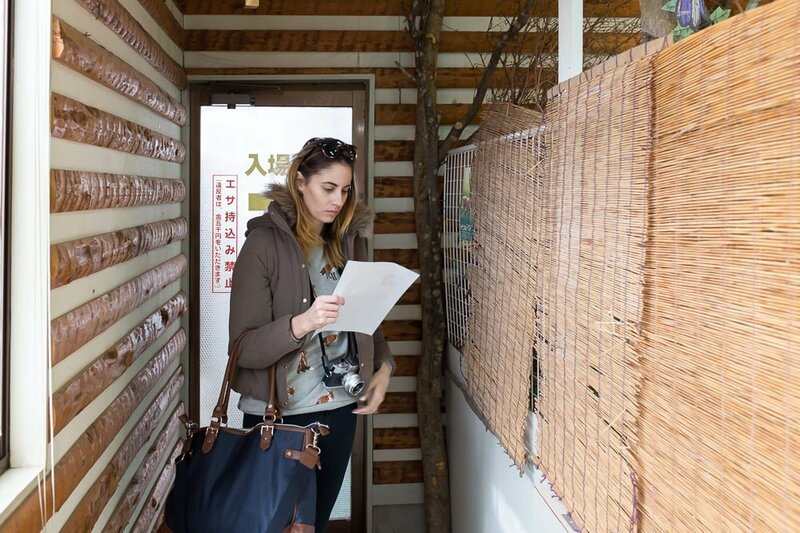 Are you heading to Tokyo soon and want to actually get to know Tokyo? My guide Hidden Tokyo was written as a comprehensive neighborhood guide to help you uncover what makes Tokyo such a complex and fascinating city – its many different districts. It outlines 18 + different districts in nearly 400 pages packed full of expert recommendations. Most people who travel to Tokyo only skim the surface – this guide goes deep. hey that pic of the guy who just risked his arm from vicious foxes (i don’t care how cute they look) to retrieve the phone – that’s me ! I just wanted to inquire, what month did you visit the Fox Village? Thank You Stephanie for this awesome blog and article. Last week, I literally just printed your article out at the Hilton Tokyo and followed what you said step by step. You made this excursion so easy. The Shinkansen ride to ShiroishiZao Station felt like it went by pretty fast and the taxi ride to Zao Fox Village was fun. Our taxi driver put on some epic video game music which made the scenic drive even more adventurous. Spent three hours in the enclosure and almost missed the chance to hold a fox because they stop that option one hour before they close. I politely asked four times and was shoving the fee into their hands — they eventually bent the rules for us thankfully. Too many great moments happened at Zao Fox Village to describe here. One fox nipped my hand (no blood resulted) when I wasn’t paying attention but I had been forewarned and I don’t consider this a problem. I’m glad this sanctuary exists in the world. I think I saw Totoro in the woods on the taxi ride back to the train station! On the subject of food, there is a Starbucks at Tokyo Station and we loaded up on sandwiches to eat on the bullet train ride heading north. On the way back, there was an inexpensive noodle/broth little restaurant at the ShiroishiZao Station which was really good since we were hungry and cold. That lady serving up the noodles was so kind and ever-smiling 🙂 I recommend making Zao Fox Village the only excursion of the day—we tried to do something else that night with friends but I was feeling quite exhausted. Highly recommend this trip to Zao Fox Village! Thank you for the comment, I’m really happy you enjoyed my blog! I’m SO happy to hear that I was able to help you in your journey to Japan. Thank you for your trip recap! It sounds like you had quite a nice trip to Zao. Those foxes will definitely nip at your hands, especially if they think you have food! What an awesome post! 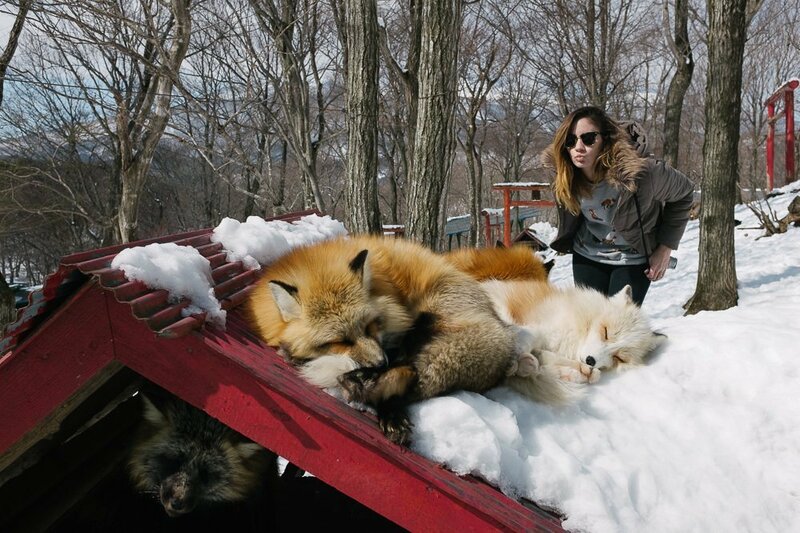 I leave to Japan in two weeks and the fox village is one of the last stops on my itinerary. I’ll be heading there from Tokyo. Do you mind if I ask where your directions are from? It takes about 4 hours to get there from Tokyo by train + the taxi you mentioned, and you said you only stayed there for about 3 hours. I’m an animal-lover, but am wondering if a day trip is worth it for 8 hours of travel? Hope to get your feedback! Thanks for the super useful post! I had a question about the $300 spent for the day trip – do you mind elaborating more on what goes into that price tag? I have 8000 yen for the cab ride from and to the Shiroishizao station which comes out to be about $73. Would the price still be $300 if the JR pass is bought? How long did you stay there for? Was there any other shops around? Hi, we were there for just an afternoon only. There weren’t really too many shops because this place is kinda by itself in the middle of nowhere. We took a taxi there and back to the station. Good luck! Hi, would like to email them to find out if they’re open in October 2016 and what the days they’re closed. Do u happen to know the email address ? I want to go there badly! But I heard it might be closed now due to earthquakes.. Is that true? And that cab is quite expensive! I got a JR pass though.. So is there any route that the JR pass would cover? 🙂 and it is not far from tokyo from what I read 🙂 if we leave early thats very do-able! Hi! I haven’t heard anything about the park closing from earthquakes but I’d suggest emailing the park to make sure hours haven’t changed. Your JR pass should cover you there on the Shinkansen because that’s the JR line. As for taxis, they are expensive all around Japan. Maybe you can take a bus but I only took a taxi so I can’t help you with the bus schedule. Good luck have fun! Hi Stephanie. Great blog! Was wondering if the Shinkansen from Tokyo is covered by the JR pass? You say the day costs $300 but I could only work out $100 (I’m converting 8000 yen for the taxi return ride). Is it the entry fee that’s expensive? thanks so much for your help. Hi, your post if extremely hopeful because we plan on going next year! 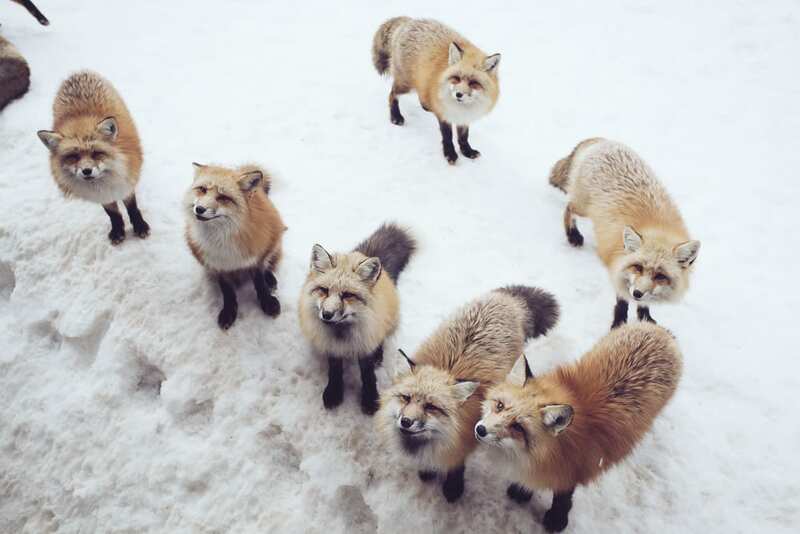 your photos of the foxes are also very beautiful. I was wondering how you left to go back to the station? did you have to call a cab or was there more cabs outside the village versus when you got out of the station? thank you! It’s really easy to call a cab once you’re ready to leave. There’s a nice store inside with a cafe and they will call it for you. It took about 15 mins or so to arrive. Have fun! This post was so helpful! I’m going to Japan in a few weeks and am going to make the day trip from Tokyo! It looks amazing. What month did you visit in? Also, just discovered your blog and I LOVE it! Thank you, so glad to hear! I visited in February. It was cool because there was snow on the ground, but I think any time is fun. thank you for this post! now i definitely have to visit the Zao fox village one day!! Thanks so much!! I hope you can visit, it’s a neat place to see in Japan! Adorable pictures! Thanks for the info! I’m planning to go to Tokyo in early spring. I’d like to visit the fox village and the cat island (Tashirojima) on the same trip as they’re both close to Sendai, maybe a 3D3N. Do you know if there’s an easy way (except taxi/car) to get to the Fox village from Sendai? Loved your article! The place really sounds amazing! Thank you! I wasn’t looking for lockers at the time so I can’t say for sure, but most Japanese train stations all have lockers. I expect it would too since it’s a Shinkansen stop. I think at the least you can probably store you luggage at the fox farm. Hope this helps!! is there any optional transportation other than taking taxi to get there? If you have your own car that would work, but from the train station, you need a vehicle to reach the fox village. I don’t believe there is a bus there. But it’s quite simple to get a taxi to get there from the train station. And the front desk at Fox Village calls you a taxi back when you are ready to return. I only spent an afternoon there, probably about 3 hours. It’s a pretty small enclosure but that was enough time for us. awesome, thanks! is there anything else interesting to see while i’m around that area? I went to the small coastal city of Kessenuma to visit; it’s devastating to see the loss but very eye opening. Sendai itself is a large city too and offers some attractions like castles and temples as well. I got there around 11:30 to 12PM. Me and my girlfriend will be visiting the village this June! Thanks for the great blog without it we would’ve had a lot of trouble getting there! Wow this looks like a really lovely place for a visit. It’s awesome to see Japan through the eyes of someone who lives there and it’s on my list of places I want to visit. It is! Japan is seriously the coolest country! I do hope you can make it out here someday. There is way too much cuteness on this page!! Heart parts all over the room! As I’ll be going Japan in end of March till mid April, I was wondering if it is the place is only accessible via taxi? And I’ll be travelling alone as its my solo trip before turning 21 🙂 Also, will it be easy to get cab on the way back to the station? This place is VERY easy to get to, especially from Tokyo. I took the Shinkansen to Shiroishizao and then once you get there, you will either have to wait for a taxi or have the small trip office outside of the train gates call one for you. Make sure that the park is open though, but it normally closes at around 4:30 though we got there around noon just to be safe. OMG THIS IS THE CUTEST THING I HAVE EVER SEEN!!! Phew… okay, sorry. Got a little excited there. 🙂 I LOVE foxes and these are the cutest, smiley-est, fluffiest ones ever! I can’t believe how close you can get to them. I gotta be honest and say that I’ve never had a HUGE desire to go to Tokyo (though I want to, of course), but seriously, while scrolling through these pictures, I told the boyfriend that I want to go right now!! I’m pinning this post for when I eventually make it to Japan. And I’m gonna be more budget conscious so I can save enough money to take that trip since it’s not cheap! And I was going to ask if you can pet them, but you got me covered! Yes they are really cute and it seems a nice place to visit. 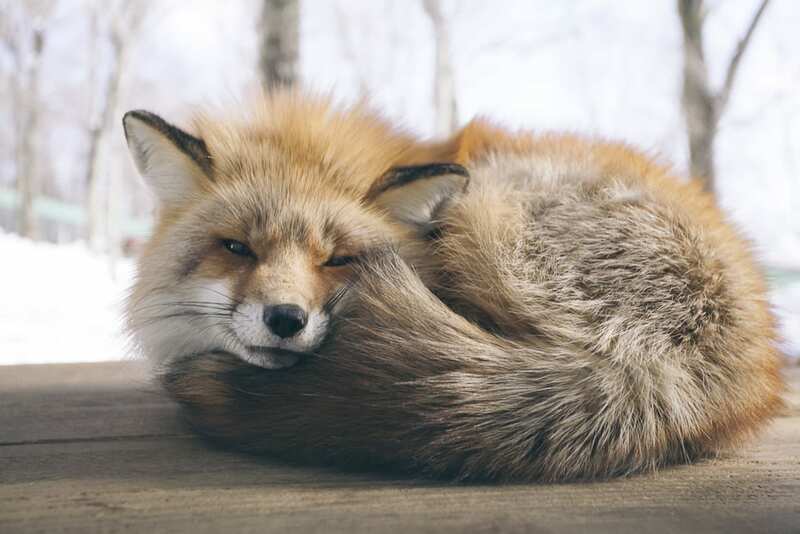 As for the cutest fox I vote the one on the 3rd picture…the one that is curled up and looks like wearing a fur collar (well she actually is). As for the photo stealing I’m pretty annoyed with travel bloggers who through a bunch of photos on a post (ok sometimes with credit) to “write” about the 10/15/[insert number here] place on Europe/US/[insert country/continent] here that you have to visit, when it’s clear that they haven’t been in all these places…I think it’s better to write out of experience! Oh my gosh, you weren’t kidding when you said they look like they’re smiling. SO MUCH CUTENESS! I will definitely be putting this place on the list whenever I get the chance to go to Japan! Nope. Yea, totally recommend it! Tons of cute.